After 526 arduous laps and 700 kilometres on the Monaco Switchback Circuit at Dubai Kartdrome, Bin Drai Karting Team, with drivers Andre Caiado, Miguel Neto, David Terrien and Pedja Jakovljevic, nabbed its third win in a row on Saturday (October 20) to maintain its lead in the Pro ranking of the 2018 Endurance Championship. Dmitry Levin, Konstantin Mandrikov and Victor Agafonov of LD Russia took over the Corporate category with an impressive class victory, as well as solidifying their top spot status in the Nations Cup. Cambridge Middle East Interiors controlled the qualifying session early on until Andre Caiado of Bin Drai Karting Team took to the Monaco Switchback Circuit and powered out a blazing best lap time of 1:15.726 to top the timing screens. New to the championship for this round was a sprint race to determine the final grid order for the endurance event. 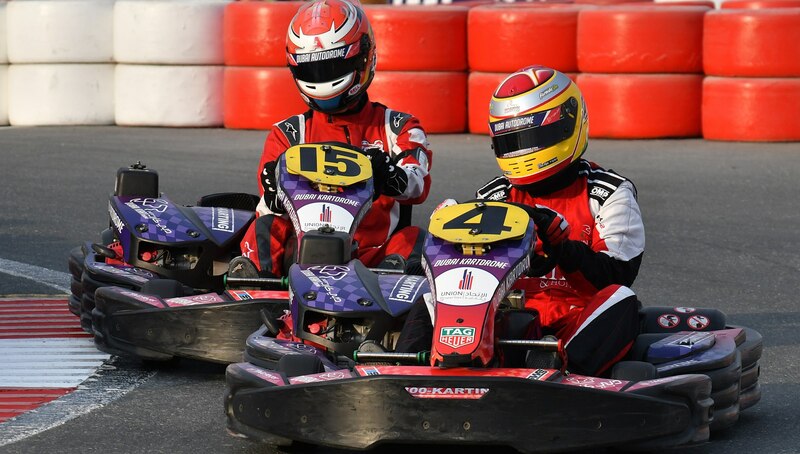 Bin Drai Karting Team and Cambridge Middle East Interiors resumed their battle over nine laps and again Caiado was the hero, taking the chequered flag over a second clear of Emirates Pro. Cambridge Middle East Interiors settled for third place, while the 2015 Pro Champions, Dubai Falcon Racing Team, placed fourth. In the Corporate category, Redline Racing upset the favourites, beating out Team Emirates in the sprint race and lining up fifth on the grid. Team Emirates, the defending Corporate champs, lined up in sixth place. In the Nations Cup, for drivers of the same nationality, the all-Russian outfit of LD Russia took ninth place, which was just enough to beat another Russian squad, newcomers Eau Rouge. After the famous Le Mans style start of the third round of the Dubai Kartdrome Endurance Championship, three Pro teams emerged as frontrunners in the 700-kilometre endurance race. Polesitter Bin Drai Karting Team brawled with Cambridge Middle East Interiors and Emirates Pro in the opening laps, with Dubai Falcon Racing Team just behind waiting to pounce on the top three. The unexpected deluge during the night caught many teams off guard, with slippery conditions and slow lap times throwing off well calculated strategies for pit stops. As the first drops fell, Bin Drai Karting Team dropped down the grid order, taking a series of pit stops ahead of most of the field. It was deliberate manoeuvre that would bring the race back to the team later in the contest. Gained they did, and by midnight the drivers of Bin Drai were back in command of the race. Several of the visiting Russian teams also enjoyed the familiar wet weather. As Corporate leader, Team Emirates, tumbled backwards down the field in the tricky conditions, LD Russia and Energy Russia moved up to take the lead in class. 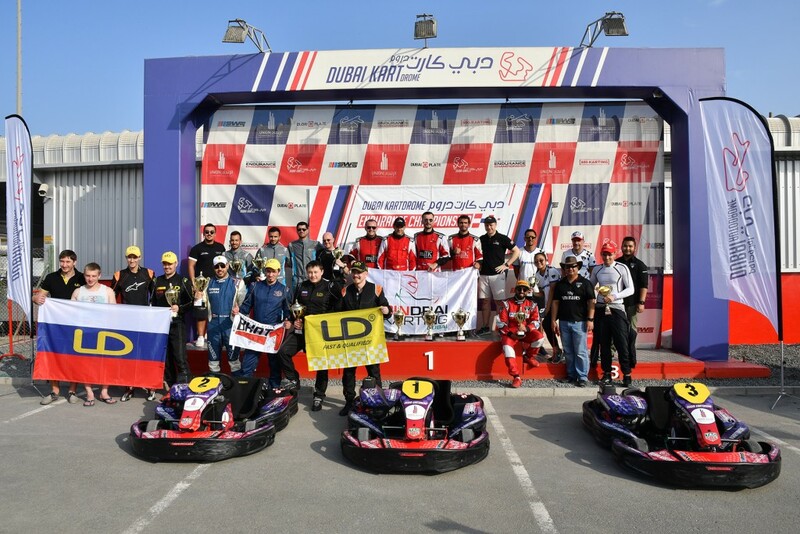 While the Russians dominated the Corporate and Nations Cup categories, Cambridge Middle East Interiors and Emirates PRO were busy chasing down Bin Drai Karting Team for a shot at the overall win. Both teams closed the gap by the early hours of the morning, but the drivers of Bin Drai managed to keep focused and stay out in front. 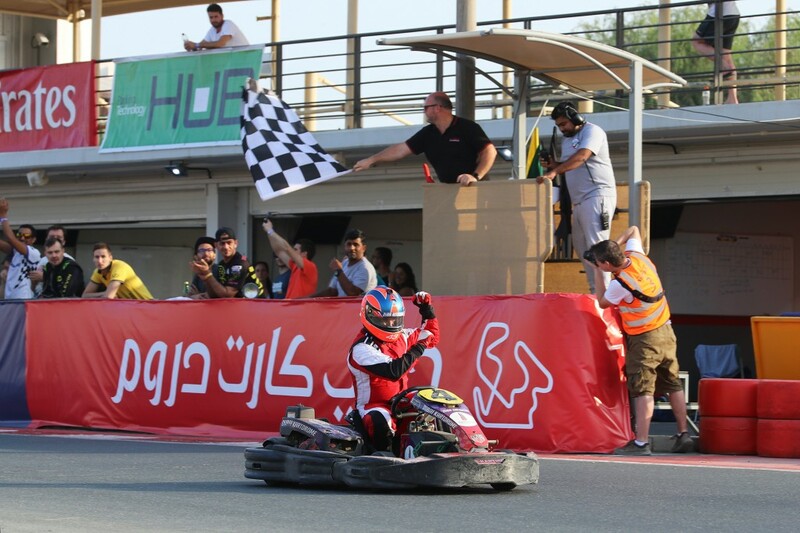 After almost thirteen hours of endurance racing, Miguel Neto completed the full 700 kilometres for Bin Drai Karting Team, crossing the finish line 48.506 seconds ahead of Cambridge Middle East Interiors. On paper Bin Drai had a perfect weekend, scoring a karting hat-trick by topping qualifying, the initial sprint race and the final endurance race. Bin Drai Racing Team have also gone three-for-three to maintain their lead in the Pro Championship with a total of 120 points. Emirates PRO, on 99 points, and Dubai Falcon Racing Team, with 97 points, both have a great challenge to try and catch Bin Drai in the fourth and final round (14-15 December). LD Russia walked away with two trophies last weekend, having cleaned up in both the Corporate and Nations Cup categories. LD Russia has now moved into the Corporate Championship lead with a total of 110 points, jumping four points clear of Team Emirates on 106 points. Both teams could take it all in the final 24-hour round. Another Emirates squad, Fly Emirates, is mathematically in contention with 76 points, but most likely it will be looking to secure the third step of the podium over rivals Roland Berger. In the sub-category Nations Cup, for teams with drivers of same nationality, LD Russia is firmly in control with 115 points. Prudent Motorsports India is in second-place on 80 points, while the Omani squad of Omantel Makasib 2 is pursuing in third position with 70 points. 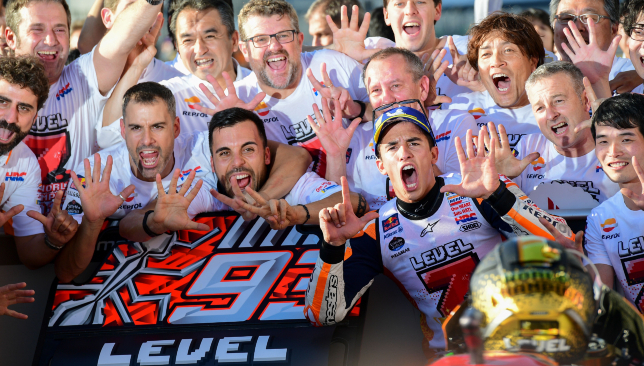 Marc Marquez secured a third-straight MotoGP crown – and fifth of his career – with victory in Japan. The win at Motegi was the eighth of the season for the Spaniard and drew him level on five titles with Mick Doohan and only Valentino Rossi and Giacomo Agostini have won more. Marquez started from sixth but it did not take him long to find his way to the front of race. Pole-sitter Andrea Dovizioso took advantage of a Marquez error to move into the lead but with just three laps remaining the Spaniard claimed the lead once again. Dovizioso lost control and slid onto the grass as he tried to pass Marquez handing the Honda rider victory and the title. Alex Connor took a big step forward in his racing career following a successful debut test in British F4 at Croft. The championship is designed as a low-cost entrance to motorsports racing and is aimed at young racing drivers moving up from karting, with Dubai-based teenager Connor following in the footsteps of Lando Norris who will be racing in Formula One for McLaren next year. Not only was it Connor’s first test in a British F4 car, it was the first time he had driven a car of any kind. 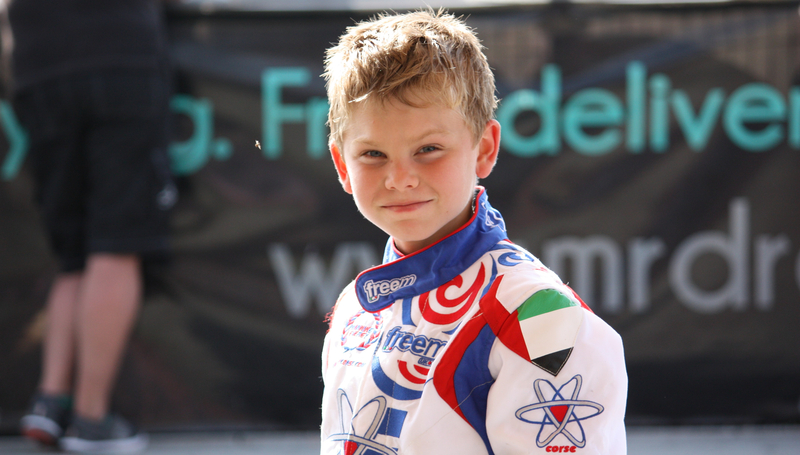 However, the 14-year-old took the challenge in his stride and his graduation from karting couldn’t have got off to a better start, with the rookie impressing during two days of testing in the UK at the end of September. Although he had no prior experience in a car, Connor had been working hard to prepare for the test. As part of the Young Racing Drivers Academy (YRDA) programme for the past 18 months, he has spent time at the Arden Motorsport factory simulator facility. Under the guidance of Steve Hutchinson, he had been putting in lots of laps of the Croft and Anglesey circuits during the summer. By the end of the first session, Connor’s confidence was there for all to see. He was adapting to the car a lot quicker than usual and given he had never been in a car before, his lap times were very impressive. 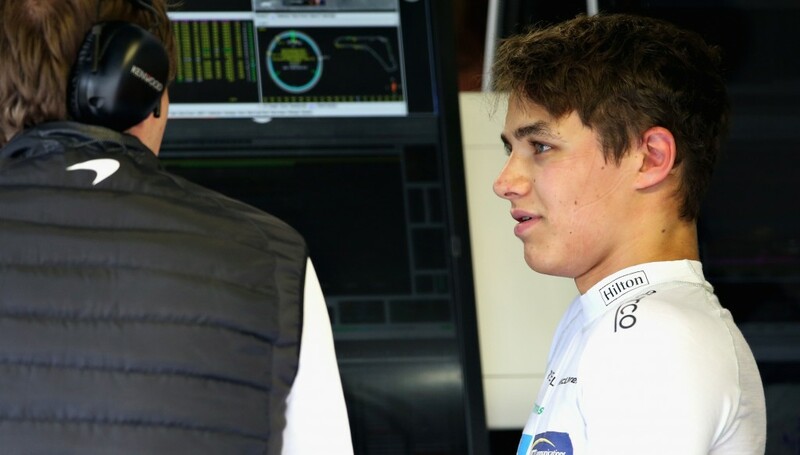 Lando Norris will become the youngest Formula One driver in British history next season. Following day two’s testing, everyone in the Arden Motorsport team and the YRDA were extremely impressed with Connor’s commitment. “Overall the two days were really good and I was happy with what I had achieved,” said Connor. Academy director Steve Hutchinson was thoroughly impressed by what he saw from the teen. “Alex Connor’s journey in single seater racing may only just be beginning but looking back on his first test at Croft, there are already so many positives and things to look forward to,” beamed Hutchinson. “Over both test days he never put a wheel wrong and we were all very impressed with not only his progress, but his ability to implement our feedback and his consistency too.